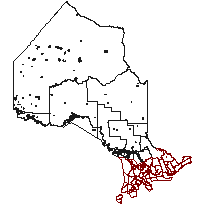 This layer contains areas of upper-tier and district municipalities in Ontario. An upper-tier municipality means a municipality of which two or more lower-tier municipalities form part for municipalities purposes. Municipal responsibilities set out under the Municipal Act and other Provincial legislation are split between the upper tier and lower tier municipalities. Territorial district means a geographic area in northern Ontario, which is described in the Territorial Division Act and is composed of municipalities, geographic townships, and unsurveyed territory. To identify the location of Upper Tiers and Territorial Districts. Data created using personal geodatabase version 8.3. 1) line feature class created 2) topology created to eliminate topological errors: - lines must not overlap - lines must not intersect - lines must not have dangles - lines must not have pseudos - lines must not intersect or touch interior 3) polygon feature class created from line feature class 4) another topology created on polygon feature class - polygons must not overlap - polygons must not have gaps 5) attributes assigned; Geodatabase. Additional Time Period Information: Updates are done as required. Changes may occur as a result of correction of errors or improvement in positional accuracy, at any time. Municipal boundaries from paper maps: Some of the data came from municipalities in the form of paper maps, Municipal boundaries obtained from paper maps. Municipal boundaries from digital sources: Some of the data came from municipalities in the form of digital data, Municipal boundaries provided in digital format. Wateredge: MNR water egde coverage.